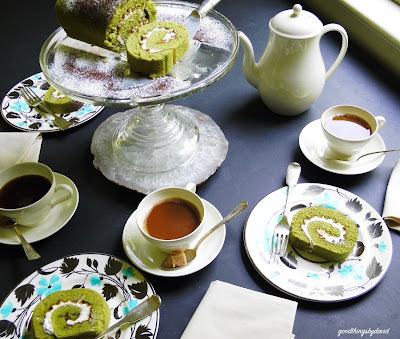 I love green tea to no end. It's the tea of choice for myself when I'm at home in the afternoons. If I'm in the mood for only a cup of green tea instead of an entire pot, I reach for my precious supply of matcha powder. 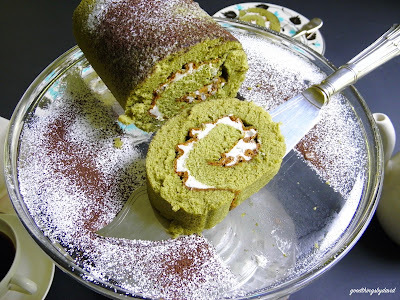 I've never, however, eaten anything made with matcha until this weekend. After getting over what seemed like the worst cold ever, I felt good enough for some dessert. I've repurposed this large fish knife for cake slicing. 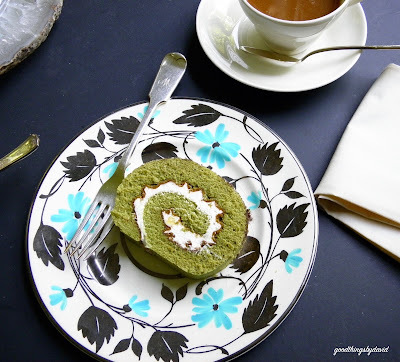 Cake rolls are the perfect thing to serve for those who don't like sweet cakes. 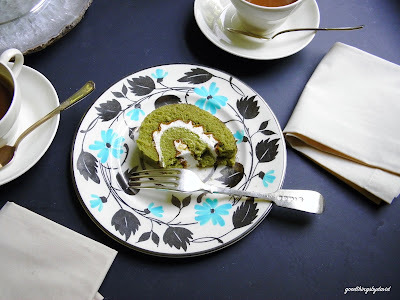 Made with a sponge cake base (eggs, sugar, milk and flour--no butter), the finished product produces a very light cake that can be served with either tea or coffee. It's great for a luncheon dessert or for the end to a weekend dinner. 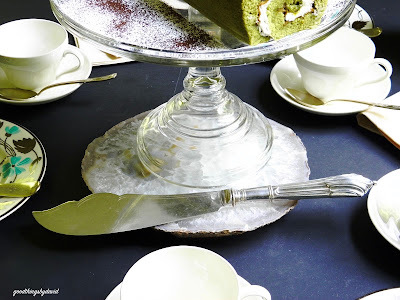 Cake served on a vintage cake stand. Vintage Wedgwood Queensware, old lustreware dessert plates and antique silverware. Matcha powder gives cakes a very nice flavor and an intense color that can't be reproduced with food coloring or artificial flavoring. This is why it's imperative to use the best matcha powder you can find. What do I use at my house? I love an organic matcha green tea made by Mighty Leaf. Look for it at Whole Foods. 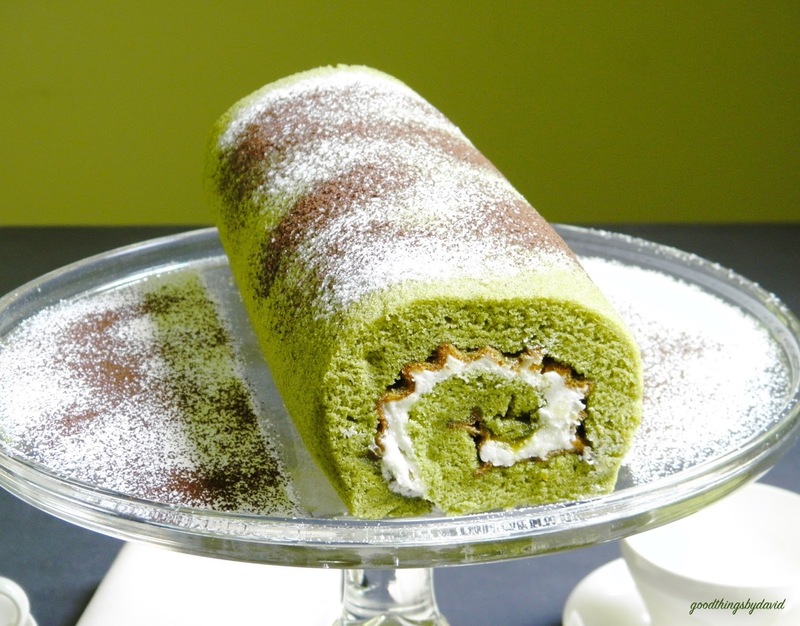 This particular cake roll was filled with a very thin layer of apple jelly and some lightly sweetened whipped cream. The cake was then gently dusted with both confectioners sugar and some Valrhona cocoa powder right before serving. I hope everyone is having an auspicious beginning to their summer. Happy eats!